So I played orks back in Rogue Trader and I don't remember winning once, all those damn malfunction cards my opponent got to play against me. I played in 2nd Edition up to and including when the first codex came out. I may have even entered them in a small local tournament. 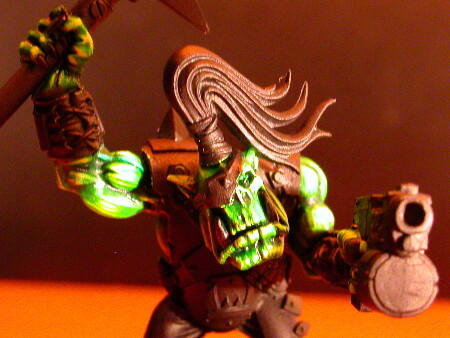 During the black codex days I started using Chaos allies getting some use of the loyalists that came in the box. Eventually I started playing my Nurgle chaos army more than my orks, then my orks shelved entirely. The boyz were my first army so they are anything but organized. They are also painted cartoonie. After years of trying to win or at least do very well in painting at tournaments I've decided I have to lower my standards in order to play more. With all the hype over the new codex I started schemeing on what it would take to make my army legal. I have a lot of stuff. Enough to fill up an entire force org chart without buying much new stuff. I bought the Assault on Black Reach boxed set and am of course doing a Nob over a terminator, I'm trading the loyalists away for more boys. 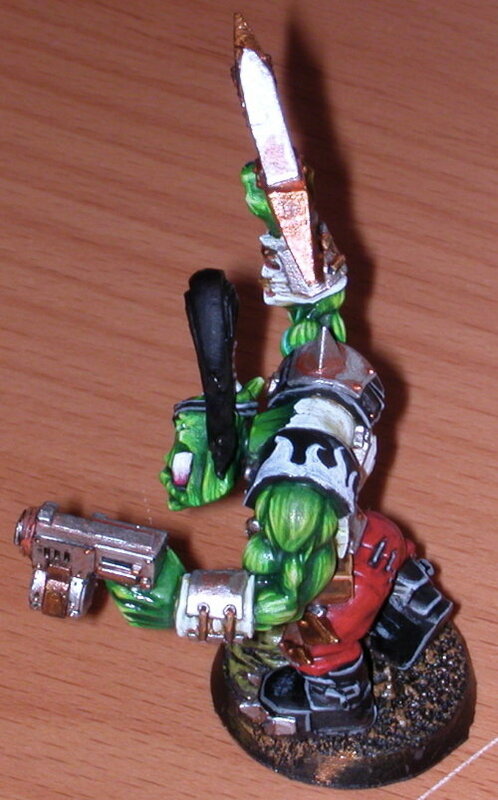 I played Gorka Morka and painted two gangs in one weekend to demo the game at a tournaments, so some of my old RT orks escaped from their blisters or their foam cacoons and had some fun in the dessert, now I'm trying to take all my ork stuff and get it legal and on the table. This project will start in earnest next year maybe, but I've given it a lot of though, even ordered some Forgeworld bitz. 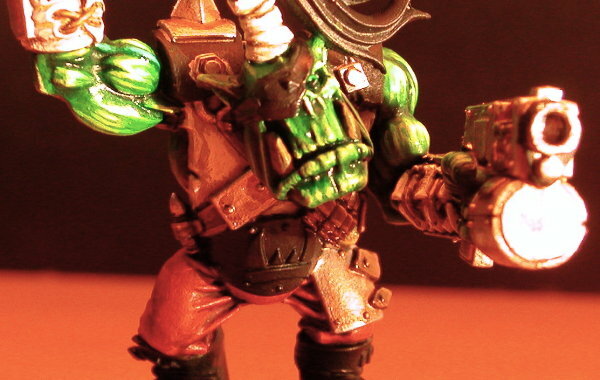 You can see my first ever orks, the metal ones that now are about the size of a grot as well as other stuff I've painted over the last ten years in this gallery. I gotta go double check I can paint inprogress photos of my Black Reach Nob. So it didn't say you couldn't post inprogress shots. In fact it said they were not interested as no conversions are allowed. So far I cleaned and primed by Nob black. I opted for the exact one picture in the contest thread. I new Orkhide shade on the skin, but it was so dark I think it was largely a waste of time. 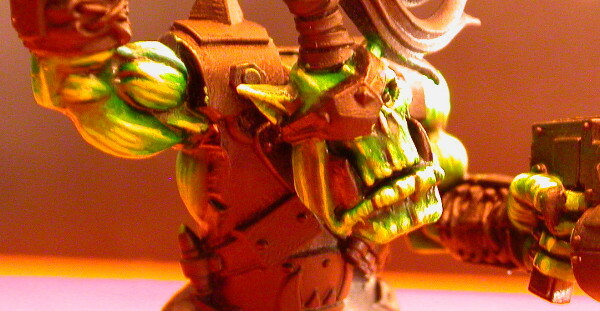 Then I painted an older pot of Goblin Green on the muscles, this was a bit sloppy but that doesn't matter. 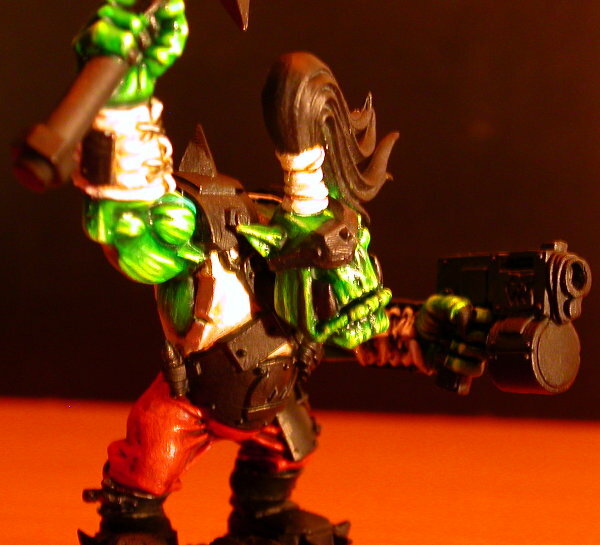 Then I painted more lowlights in the crevices of the skin with Dark Angels Green, finally another coat of Goblin Green and then the new Ork skin wash. 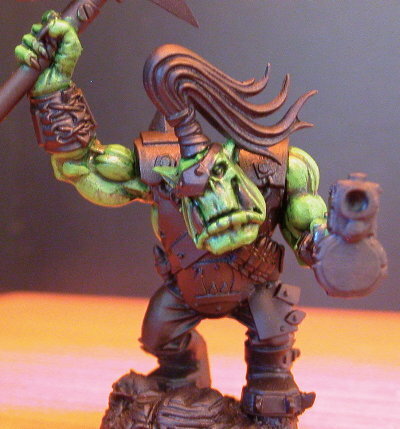 I used Knarloc green, highlight up with rotting flesh. 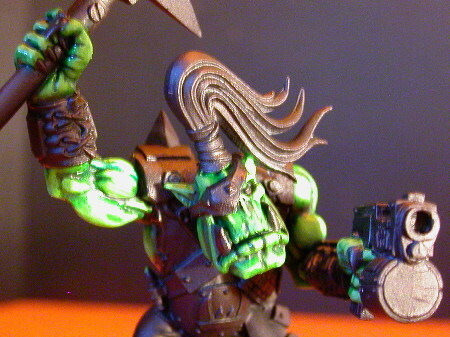 Then put a Thraka green wash over it. It look spretty good so far but, I think you might get better reults if you used a Matt black primer. This one looks a little shiney, like it might be a Satin finish. Paints tend to adhere better to Matt finishes. The first picture is after three more coats of green or there abouts. I took these pictures late at night so the lighting is overly harsh, I was no longer improving things with my washes, glazes, highlights, and lowlights... This will have to do for the most part. Looks gerat so far! It looks like you've got a very good skin-tone painting technique! Looking forward to seeing more. The pants are a dirty red, which uses a variety of colors and may receive another wash and highlight, I wanna avoid going up to orange. I'll see how it looks in the morning under the sunlight. Here is the latest picture of the Nob. I didn't paint at all yesterday, but today I finished the leather bits and gave the metal bits a good seeing to. Anything black isn't painted yet. I may highlight the red pants more but I kinda like em dark and dirty looking. The whole model will get some rust, grit, dirt and blood, but for now it is relatively clean. I use a lot of washes sometimes and let the black basecoat peak out too. I need to get this guy and basically all my painting done today because my life is way too complicated and I need to simplify it. I decided to take a picture before I had all the final details done. The hair is completely undone and I may do some highlights on the trowsers or whatever, but I started the flames and I did the base early so as to keep his boots clean until I add my final coat of rust, blood, and gore. Not done yet, but the flames came out pretty good and I've mostly fixed up the skin and tidied it up. I have a few more finishing touches, but some techniques I wanna try out will have to wait until the next model. I might add another layer of highlights to the pants of the hair, but I kinda like it dark. I gotta decide before I do any weathering, but I think I can improve the rust, so that is next. How many kans can a killa kan kill if a killa kan can kill kans? Please also refrain from putting your painting business/watermark logos on the picture as well as we would like to keep this as anonymous as possible (just like in all the past contests). 6. There is no WIP shot for this contest so you can enter the minis if you've painted them already. However please do not enter said minis if you have already entered them in other contests as we will disqualify you for that. The voting will be done by the B&C guys and I never put watermarks on any of my stuff. I'm just a guy, not a mercanery painter. Besides I think it helps stay motivated having a date and an inprogress thread. Man! That paintjob is so 2nd ed! 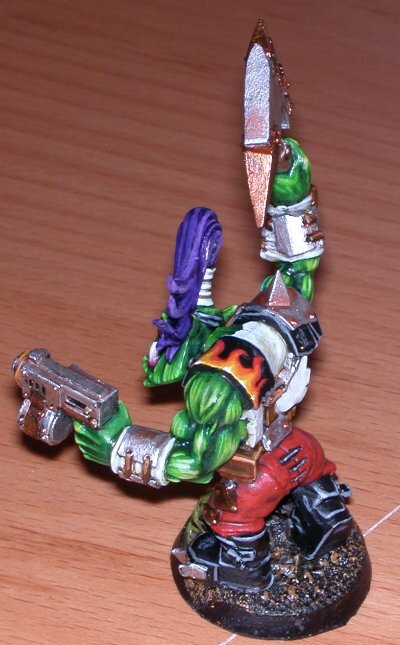 Flames and blue/purple hair, that's what orks are about! Love it! Good luck in the contest. Everyone will have tough opposition when competing against you! Only critique I have is that the highlights on the boots are a bit loud... you might want to tone them down a bit. I did the Badab wash, I wanted the boots to be not brown, as the base was going to be mostly brown, but I should have perhaps done them something other than black. I'm not finished yet, assuming I don't get disqualified, I have one or two tricks up my sleave still. I also think I've painted it more since the last picture, I put more hours than I perhaps intended into it... I should be studying. excellent work, always been a fan of you diseased sons. 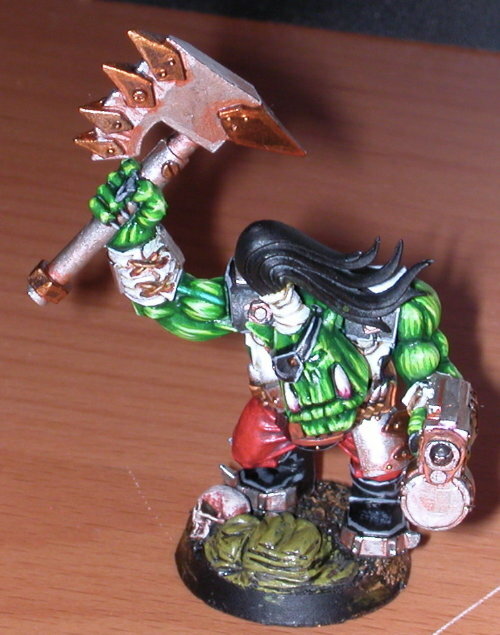 can't wait to see what you can do with orks. all the best. "Because no warrior should face battle sober..."
So today after having it sit for months in my living room, I built my Ikea display cabinet. I put my 40K ork army in it, even though that is my least well painted army. I've got the other two main armies I've worked on over the years already on shelves. I need to buy two more of those display cases. I forgot about some of the things I have painted, but my estimate of 60 painted boyz which includes lots of oddboyz was pretty accurate. Some of them are loners, others have a squad they belong to. Some squads are only 5-6 models as that was legal back in the day, others have 7-8 and some are 10+ but no big mobz, I just bulked them up with unpainted stuff but I had about 2000pts painted. I have a couple dreads, a couple wartrakks, a couple warbikes, a looted rhino, etc. etc. I will be working on this in December or in the new year. When I have some sunlight, I'll take a picture of the at least partially painted stuff. I plan to work on one squad at a time getting them legal, though I already can field a legal army, I just don't know for how many points. 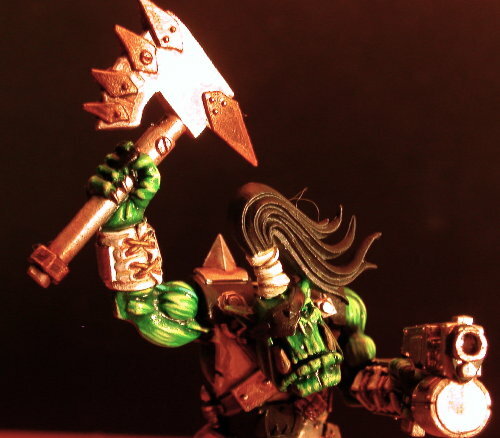 First will be the Blood Axes as that was the original squad/models I painted with just the Orks VS panzee paint set plus black and white. No washes back in the day, and questionable sealent... I'll see what low hanging fruit I can improve on the paintjob but mainly I just want them legal, gone are the Heavy Plasma Guns, I might convert the odd one to a rocket launcher, I already converted one to a skorcha in my Gorka Morka Gang So Blood Axes Badmoons Evil Sunz Goffs Noticing a pattern, I pretty much have one of everything I had rules for, I got a lot of stuff unpainted and even still in blisters. I'm going to have to do some trading or eBaying in the new year, I just got too much stuff. I don't need an army bigger than one force org chart, I've never played apocolypse so things like a third weirdboy or a fifth warboss... I don't know we'll see where things are at next summer, but I'm pretty sure I have stuff I'll never use especially loyalist bits.